Food service operators are shifting to digital signage solutions. Static menu boards are becoming a thing of the past. These state-of-the-art digital displays offer many advantages – great aesthetics, easy reading, easy content management, and connectivity with the web. The ability to easily update menus is a great cost-saver and motivator for foodservice operators to experiment with menus and offer what the customers want. It was not easy to update static menus, unless the menu was on a whiteboard updated manually with a sketch pen. With digital signage, you can easily display updated prices, the day’s menu, new items, and at the same time remove items that have been sold out. These help with efficient service, greater customer satisfaction, brand recall and loyalty. Digital signage for food service outlets must fulfill criteria for reliability and easy operability. Before you select digital signage, you need to first have a goal in mind so that you can measure different DOOH systems based on a set of criteria. The criteria should include near- and long-term objectives that you wish to achieve. The goals should, in the best case, be achievable within the life of a system, so that you don’t have to invest in new digital signage before the objectives are achieved. Objectives can include reducing order times, shortening queues, facilitating self-service, customer engagement, better employee management, etc. The monitors you choose should be rated for use 24/7. Many operators may settle for monitors rated for use 16 hours each day. Choose monitors that won’t let you down. If a screen goes dark, it will not only stall business but also reflect poorly on the brand. Choose monitors with anti-glare screens and high-resolution displays. The equipment must be housed in a sturdy mechanical body. Digital signage system comprises monitors, players, software, and hardware. If any part of the system is substandard, it will hurt the performance of the system. As a food service joint, your core competence is food. You may not be able to maintain and manage the system in house. Compare providers that offer strong warranties and support. The signage should be easy to use so that your staff can change menus and create content easily. The learning curve for using the system should be as short as possible. Can you operate the system via the cloud? This is a useful feature for food joints with branches across different geographical locations. 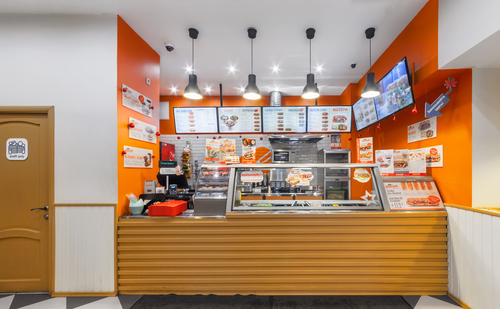 Some of the world’s biggest fast-food chains have made the shift to digital signage, and if this trend is any indication then digital menu boards have truly arrived in the fast-food sector. Installation of digital signage has been linked with increased sales. Fast food joints have installed such signages in the eating areas of their premises and at other locations. The result is a more modern look that appeals to patrons. For many of these big joints, the deployment of digital menus has increased sales by 10% and more. Digital signboards at drive-through joints are becoming popular; however, there is a long way to go. At present, only five out of 100 Quick-Service-Restaurants (QSRs) have these signs. Cost is cited as the main hinderance. However, a little thought tells us that even with the current costs of installing DOOH at drive-thrus, food joints will only benefit from the technology because of the increased efficiency and reduced order processing times. As many as 70% of the customers of a restaurant are serviced by drive-thrus. Improved service and shorter times over here will assuredly increase sales. The convenience of drive-thrus makes them a beloved aspect of the American eating out landscape ever since the first drive-thru was opened in 1947 in Springfield, Missouri. The displays can be used to flash promotions. Analytics obtained can serve to tweak the promotions based on sales, order size, fast-moving items, etc. Overstocking can be centrally managed by running special deals managed remotely. Digital signage at drive-thrus is a big help for another good reason. Over the years, drive-thru menus have evolved to offer varied menus. Fulfilling an order can take time. Wait times have grown by more than 10% in some cases. With digital signage simplifying order selection and order placement, drive-thru establishments have been able to fulfill more orders than earlier. The location of the digital signage at the eating place is very important. It has to be powered, which means you may have to pull an underground power line to the display. The base of the display unit has to be sturdy and level. It must be sufficiently raised to ensure that the area does not get waterlogged, if that is a concern. Outdoor digital display panels cost more because they have to be sturdier. Size, choice of controls, warranties available, and of course cost are factors on which you can compare outdoor digital displays. Integrate the displays outside with other systems, so that your customer is always easily within reach for communication. POS, NFC, the Internet, and VODXS system are technologies that you must implement. The last mentioned is a wonderful tool for communicating with an audience in washrooms. 2. The Power Of Doing Only One Thing..
3. Your Work Is the Only Thing That Matters. 4. Amazon ad business projected to grow 50% this year. 5. Influencer marketing – it’s effective, but quality of influencers and measurement are key concerns.